 Log In needed $40 · Queen Satin Comforter Set 4 Pc. Selling this beautiful satin comforter with matching pillow shams and dust ruffle. It's fill is polyester fibre-fill and is for a queen bed but can be used on a double bed. 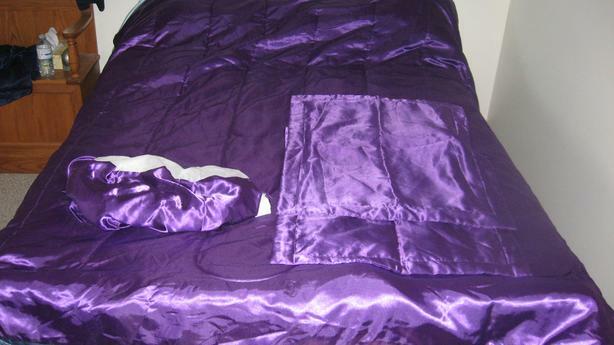 It is a regal or royal purple and is satin on the face and a silky nylon on the reverse side. It has a very simple box type pattern. Typical Hollywood glamour. Machine wash in cold water and tumble dry on low heat. DO NOT use fabric softener sheets in dryer. This would be an excellent comforter for a young woman or teenager. Great for the dorm, camping, cottage, RV and so on. This will keep you warm and cozy on those winter nights.